An acute subdural hematoma is a rapidly clotting blood collection below the inner layer of the dura but external to the brain and arachnoid membrane (see the first image below). Two further stages, subacute and chronic, may develop with untreated acute SDH. Generally, the subacute phase begins 3-7 days after acute injury (surgical literature favors 3 days; radiologic literature favors 7days) (see the second image below). The chronic phase begins about 2-3 weeks after acute injury. 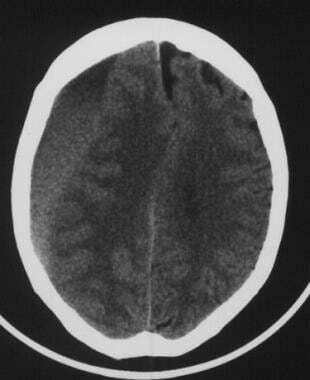 Acute subdural hematoma. Note the bright (white) image properties of the blood on this noncontrast cranial computed tomography (CT) scan. Note also the midline shift. Image courtesy of J. Stephen Huff, MD. Subacute subdural hematoma. The crescent-shaped clot is less white than on the computed tomography (CT) scan of the acute subdural hematoma in the previous image. Despite the large clot volume, this patient was awake and ambulatory. Image courtesy of J. Stephen Huff, MD. See also Subdural Hematoma, Subdural Hematoma Surgery, Imaging in Subdural Hematoma, Closed Head Trauma, Head Injury, and Forensic Autopsy of Blunt Force Trauma. Consult a neurosurgeon as soon as the diagnosis of subdural hematoma (SDH) is suspected. If feasible, patients with head trauma should initially be transported to a hospital with a dedicated trauma team because this is associated with significantly better functional outcomes in survivors of SDH. Initiate rapid transfer if another facility is required for diagnosis or management: Rapid transport to a trauma center with a promptly available neurosurgeon decreases mortality in patients with SDH. Transfer may be emergent, with appropriate stabilization measures taken and with appropriately skilled personnel accompanying the patient. Consider endotracheal intubation when Glasgow Coma Score (GCS; see the Glasgow Coma Scale calculator) score is less than 12 or other indications are present; this guarantees airway protection during the diagnostic workup. Obtain an immediate head computed tomography (CT) scan in patients with head trauma who experienced clear loss of consciousness (LOC), are symptomatic, are disoriented/amnestic, or have any focal neurologic signs. The presence of a focal neurologic sign following blunt head trauma is ominous. Elevate the head of the bed to 30°, and make sure that the head and neck are maintained in a midline position to optimize venous outflow from the brain. Hyperventilation to a target partial pressure of carbon dioxide (pCO2) of 30 mm Hg can reduce intracranial pressure (ICP) in the short term, although a pCO2 level less than 25 mm Hg is strongly discouraged. Intravenous mannitol (0.25 g/kg) may be used to decrease ICP. However, glucocorticoids are not indicated for head trauma. Rapid reversal of anticoagulation with warfarin is key and has been shown to reduce hemorrhage progression and mortality for intracranial hemorrhage (ICH). However, the potential benefit of reversing anticoagulation must be weighed against the individual risk. Options include vitamin K, fresh frozen plasma (FFP), prothrombin complex concentrate (PCC), and recombinant factor VII (rfVIIa). rfVIIa is administered at 10-100 mcg/kg (lower dose preferred due to risk of thromboembolic event at higher dosing). It has rapid onset. Improvement in mortality or functional outcome has not been shown. Burr holes are a temporizing option when rapid demise is associated with severe head trauma, especially if a herniation syndrome is clinically evident. Generally, because the lesion represents clotted blood, the burr hole is not curative, and emergent craniotomy is necessary. However, Burr holes can guide surgical therapy when head CT imaging is unavailable. Begin on the side of the (first) dilated pupil. When a patient who experienced head trauma presents with a Glasgow Coma Score (GCS) score less than 12, consider immediate neurosurgical consultation while stabilizing the patient and while diagnostic maneuvers are in progress. Small, asymptomatic, acute subdural hematomas (SDHs) may be managed by observation, serial examinations, and serial computed tomography (CT) scanning. The usual treatment for acute SDH is craniotomy and evacuation by a neurosurgeon,  who, after making a large cranial flap, opens the dura. Then, the clot is removed with suction, cup forceps, and/or irrigation. Bleeding sites are identified and controlled. Tien HC, Jung V, Pinto R, Mainprize T, Scales DC, Rizoli SB. Reducing Time-to-Treatment Decreases Mortality of Trauma Patients with Acute Subdural Hematoma. Ann Surg. 2011 Jun. 253(6):1178-83. [Medline]. Yamamura H, Morioka T, Yamamoto T, Mizobata Y. Head computed tomographic measurement as a predictor of outcome in patients with subdural hematoma with cerebral edema. Scand J Trauma Resusc Emerg Med. 2016 Jun 7. 24:83. [Medline]. Bartels RH, Meijer FJ, van der Hoeven H, Edwards M, Prokop M. Midline shift in relation to thickness of traumatic acute subdural hematoma predicts mortality. BMC Neurol. 2015 Oct 24. 15:220. [Medline]. Arai N, Nakamura A, Tabuse M, Miyazaki H. Delayed Acute Subdural Hematoma Associated With Percutaneous Coronary Intervention. J Craniofac Surg. 2016 Sep. 27 (6):e514-6. [Medline]. Shabani S, Nguyen HS, Doan N, Baisden JL. Case Report and Review of Literature of Delayed Acute Subdural Hematoma. World Neurosurg. 2016 Aug 24. [Medline]. Leung GK, Ng GK, Ho W, Hung KN, Yuen WK. Impact of a multidisciplinary trauma team on the outcome of acute subdural haematoma. Injury. 2012 Sep. 43(9):1419-22. [Medline]. Ivascu FA, Janczyk RJ, Junn FS, Bair HA, Bendick PJ, Howells GA. Treatment of trauma patients with intracranial hemorrhage on preinjury warfarin. J Trauma. 2006 Aug. 61(2):318-21. [Medline]. Gerard C, Busl KM. Treatment of acute subdural hematoma. Curr Treat Options Neurol. 2014 Jan. 16(1):275. [Medline]. Hanger HC, Geddes JA, Wilkinson TJ, Lee M, Baker AE. Warfarin-related intracerebral haemorrhage: better outcomes when reversal includes prothrombin complex concentrates. Intern Med J. 2013 Mar. 43(3):308-16. [Medline]. Zumofen D, Regli L, Levivier M, Krayenbühl N. Chronic subdural hematomas treated by burr hole trepanation and a subperiosteal drainage system. Neurosurgery. 2009 Jun. 64(6):1116-21; discussion 1121-2. [Medline]. Bullock MR, Chesnut R, Ghajar J, Gordon D, Hartl R, Newell DW. Surgical management of acute subdural hematomas. Neurosurgery. 2006 Mar. 58(3 Suppl):S16-24; discussion Si-iv. [Medline]. Mobbs R, Khong P. Endoscopic-assisted evacuation of subdural collections. J Clin Neurosci. 2009 May. 16(5):701-4. [Medline]. Bell RS, Neal CJ, Lettieri CJ, Armonda RA. Severe Traumatic Brain Injury: Evolution and Current Surgical Management. Medscape. Available at http://cme.medscape.com/viewarticle/575753. Accessed: June 24, 2008. Cabral KP, Fraser GL, Duprey J, Gibbons BA, Hayes T, Florman JE. Prothrombin complex concentrates to reverse warfarin-induced coagulopathy in patients with intracranial bleeding. Clin Neurol Neurosurg. 2013 Jun. 115(6):770-4. [Medline]. Cohen M, Scheimberg I. Subdural haemorrhage and child maltreatment. Lancet. 2009 Apr 4. 373(9670):1173; author reply 1173-4. [Medline]. Nishijima DK, Dager WE, Schrot RJ, Holmes JF. The Efficacy of Factor VIIa in Emergency Department Patients With Warfarin Use and Traumatic Intracranial Hemorrhage. Acad Emerg Med. 2010 Mar. 17(3):244-251. Wind JJ, Leiphart JW. Images in clinical medicine. Bilateral subacute subdural hematomas. N Engl J Med. 2009 Apr 23. 360(17):e23. [Medline]. 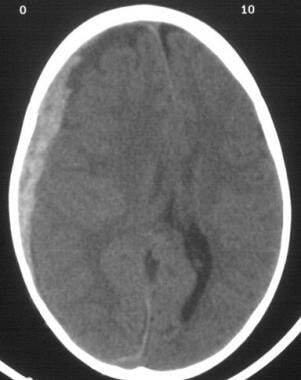 Chronic subdural hematoma. The 3 cm, isodense crescent-shaped clot is resulting in midline shift.